If you’re like most car owners in Brockton, Stoughton, and Randolph, you want to make sure you give your vehicle the maintenance it needs to run well in the future. While there are several important maintenance tasks, one of the most vital is regularly changing your vehicle’s oil. However, many people aren’t sure how often their oil needs to be changed or why this task is so important. 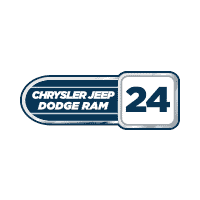 To clear up the confusion about oil changes, Chrysler Jeep Dodge Ram 24 has provided this convenient article. On this page, you can find out how often you need to change the oil in your vehicle, signs that indicate you need your motor oil changed, and why this service is so crucial. Learn more about the importance of scheduling regular oil changes and find out how you can get help from a dedicated service department. Almost every car owner understands that their engine oil will periodically need to be changed. However, few people understand why this maintenance task is highly critical for the long-term health of their vehicle. The primary benefit of regularly changing your engine oil is that it keeps your engine properly lubricated. When an engine isn’t lubricated, it can cause parts to grind and result in serious damage. Another benefit of changing your oil regularly is that it helps eliminate dirt and debris build-up, which improves engine performance. Now that you know why your oil needs to be changed, it’s important to find out how often changing it should occur. Most people assume that their engine oil and filter need to be changed every 3,000 miles. While this was true for older vehicles, newer models usually go between 5,000 and 7,500 miles before needing a change. Our service team made it easy for you to be able to find recommendations for your specific vehicle, so you can make sure to keep to the right oil change schedule. 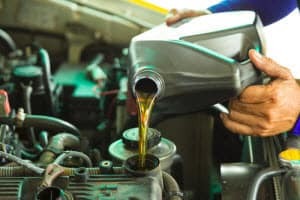 Feel free to read any one of the articles on this page to learn more about oil changes and how often to change your oil. Conventional Oil: As a derivative of natural crude oil, conventional engine oil is ideal for vehicles that face normal road conditions and driving scenarios. In addition, conventional oil is the best for motors that have simple, basic designs. With this option, you’ll have the right amount of protection against the friction and high temperatures caused by everyday driving. 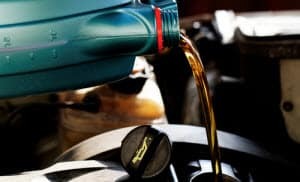 Synthetic Oil: On the other hand, synthetic oil is a type of conventional oil that’s been modified to withstand more intense engine performance and extreme driving conditions. So, if you happen to own a car that’s armed with a high-performance engine, this is a great option for your car. That way, you’ll know that your motor is equipped with the fluids it needs to handle its potent power output. Overall, the engine oil that’s ideal for your automobile depends on the motor’s design, the type of vehicle you drive, and your performance needs. To learn more about the one that’s best for your car, feel free to contact your trusted mechanic. 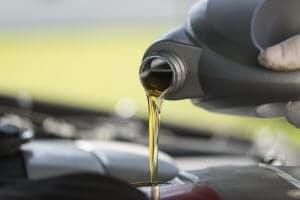 They’ll be able to provide you with more information about whether you should choose conventional vs. synthetic oil for your vehicle’s engine. Gritty or Black Oil: The more often you drive, the more oil your automobile needs to lubricate its engine. As time passes, the oil begins to become dark and gritty. To prevent that grit from building up inside the motor and causing corrosion, make sure to check your oil every once in a while. Once you see particles in the oil, reserve an oil change at your local service center. Grinding and Engine Noise: Every engine makes some noise while it’s moving your vehicle over the road. However, once those noises start sounding more intense, it’s likely that you need an oil replacement. As the oil inside your engine begins to get low, your engine won’t have enough lubrication to perform smoothly, which results in excess grinding and other sounds. Check Engine Light: As one of the most obvious signs that your engine needs to be looked at by a professional, the check engine light should immediately catch your attention. This warning illuminates on the dashboard of your car if you experience an engine misfire or if your vehicle needs an oil replacement. When you notice this symbol on your dash, make an appointment at your repair shop for a quick oil change. 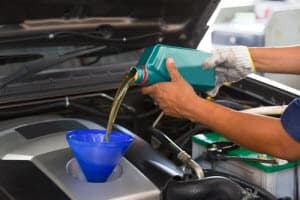 On top of scheduling routine oil changes for your automobile, there are several other important services that your vehicle should be getting to keep the engine healthy, one being regular oil filter replacements. Jack Up Your Car: To access all the parts of your engine oil filter, make sure your vehicle is jacked up high enough for you to crawl underneath it. Engage the parking brake and place cinderblocks behind the wheels to keep your vehicle safely positioned. Find the Oil Filter: Use your Owner’s Manual to locate the oil filter. Try to loosen the filter with a gloved hand. If it won’t budge, use a strap wrench to loosen it. Grab the Oil Drain Pan: Before you loosen the oil filter all the way, place an oil drain pan underneath it. Then, pull the oil filter all the way out and place it in the drain pan. Check the mounting surface to ensure that the oil filter gasket isn’t stuck inside. If it is, remove it. Tip the Oil Filter: To drain the old oil out of your oil filter, place it on its side inside the drain pan and let it sit for 24 hours. Once it’s fully drained, toss it in the trash. Lubricate the Gasket: Purchase a new engine oil filter and use clean motor oil to lubricate its gasket. Replace with New Oil Filter: Keep the top of the new oil filter covered to prevent dirt and debris from getting inside. Remove the cover from the oil filter once you have it in position and slowly turn it to secure it. Tighten the Filter: Don’t put too much pressure on the filter while tightening it. Instead, slowly twist the filter until you feel it start threading. Then, spin the filter more quickly. Once it has contacted the engine, you only need to spin it ¾ of a turn to secure it properly. Like we mentioned before, because this process can result in damage to your engine if it’s not performed correctly, it’s best to visit your local service facility to have your oil filter replacement completed by a professional. That way, you’ll drive knowing that this essential service has been seen to by a highly qualified technician who has lots of experience with automotive maintenance and replacements. If you’ve done all your research and you’re ready to schedule an oil change in Randolph, Stoughton, or Brockton, your best resource is the service department at CJDR 24. Our knowledgeable service team can help you keep to your proper oil change schedule and can assist with other common maintenance tasks. Schedule your oil change today!